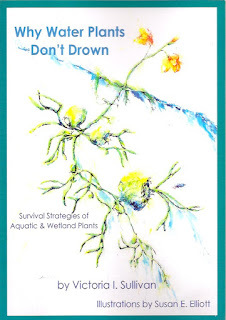 My good friend, Victoria Sullivan, has written a book, Why Water Plants Don’t Drown, about aquatic and wetland plants, beautifully illustrated by Susan Elliott, artist, ecologist, and writer with Pinyon Publishing, a quality press located in the U.S. Rockies in Montrose, Colorado. Pinyon published the book on October 15, and we arrived in New Iberia Friday to find boxes of it safely stored with our friend, Janet Faulk-Gonzales. Vickie, a writer and botanist, has a Ph.D. in biology from Florida State University and is a former professor with the University of Louisiana in Lafayette. She has published numerous botanical papers, fiction, and non-fiction, including the speculative novel, Adoption, also published by Pinyon. Vickie was recently honored by a new flower species Eupatorium sullivaniae being named after her, crediting her extensive scientific research on the Eupatorium genus. Susan Elizabeth Elliott studied botany and French at Humboldt State University and has a Ph.D. in biology from Dartmouth College. She has published fiction and nonfiction, and her paintings are showcased in Open the Gates: Poems for Young Readers by Dabney Stuart, as well as in Why Water Plants Don’t Drown. Her drawings and paintings in Why Water Plants Don’t Drown greatly enhance and clarify the scientific text. Sullivan: I wrote a children's version of Why Water Plants Don’t Drown, which was bought by Franklin Watts, a division of Grolier that was then bought by Scholastic. My manuscript got sidelined in the buy out, and my editor there didn’t continue with Scholastic. I asked to be released from the contract with Scholastic and began looking for a new publisher. 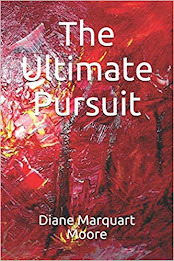 Pinyon Publishing became interested, but wanted the book pitched to nature enthusiasts of any age and to contain more science. I rewrote the manuscript, keeping the title and general categories of water plants. Gary Entsminger, the publisher, and Susan Elliott, the illustrator and botanist, provided excellent comments and suggestions for additions (and subtractions) from my draft manuscript. Moore: What do you mean by Survival Strategies of Aquatic and Wetland Plants? Sullivan: Plants that normally live on dry land cannot live in water or wet places for very long. Aquatic and wetland plants can only do so because they have adaptations that allow them to thrive in such habitats. Regardless of where they live, all plants have basic needs that must be met. They must have adequate light and concentrations of needed gases, the body must be supported, and they must be able to reproduce. Moore: Why is light a problem for water plants? Sullivan: Plants make food using sunlight or artificial light in the case of aquaria, but when light passes through water some wavelengths they need are filtered out. Plants living submerged in water must compensate by being more efficient in absorbing the light waves that they need. Light and need for gases are linked in water plants. All plants need two gases, carbon dioxide and oxygen, and these are not as concentrated in water as they are in the air above the water. Water plants trap gases in air spaces in their bodies for later use. The same plant tissue that traps gases also allows them to float in water, in other words, to be supported by the water. If you examine a water hyacinth plant, a common floating plant in parts of the US, especially the southeast, you'll see that much of the plant is made of air spaces. Being supported by water is important because if water plants sink too deeply below the surface, they’ll be below the level of adequate light penetration for photosynthesis. Being stiffly supported by hard stems and tough leaves, as in land plants, is a disadvantage in water. Water currents flowing across such stiff plants would tear them apart. Water plants that grow submerged tend to be soft and flimsy providing little resistance to the currents. Moore: How do plants reproduce in water? On land, plants have flowers that make seeds. Do water plants have underwater flowers? Sullivan: Reproduction by seeds varies in water plants and may occur after pollination underwater in some species or above water in flowers that attract pollinators. Underwater flowers are very nondescript and even hard to recognize as flowers. A common feature of water plants is to reproduce by cloning without seeds that is by breaking apart with parts growing into new plants. Hydrilla, the invasive scourge, and other water plants are able to spread as carry pieces of plants are carried from place to place on boats, wading birds, etc. In addition, hydrilla and others like it produce underground buds in great abundance that lie dormant for periods of time. Flooded soils are low or lacking in oxygen, which is a problem that rooted aquatic and wetlands plants must overcome. Roots need oxygen and land soils have oxygen in air pockets among the soil particles. The aquatic and wetland plants I call snorkelers, pump oxygen to the roots in various ways from the surface. Water lilies, for example, take in gases through stomates in their floating leaves. As the sun heats the leaves, the gases expand and get pushed down through column in the leaf stalks, all the way to roots. Excess gases are pushed out into the underwater soils providing oxygen to other organisms. Methane, or marsh gases, and carbon dioxide from the roots move up the columns within these plants and are leaked into the atmosphere through stomates of older leaves. Moore: in talking with Lorraine Kingston, owner of the New Iberia Books along the Teche bookstore, she suggested that the book should attract Louisianans because of the interest in environmental concerns – salt water intrusion and the demise of vegetation along the coast. Do you think your book will provide insights into Louisiana environmental problems? What about wetland plant loss? Sullivan: Lack of sedimentation is a major problem for wetland habitats, and finding a means of replenishing flow of sediments is needed and being worked on. Over 40% of wetland habitats in the U.S. occur in Louisiana, and between 1932 and 2010, Louisiana lost 25% of its wetlands. Levees channelized natural waterways preventing overflow, robbing wetlands along the watercourse and coastal marshlands downstream of a flow of nourishing sedimentation. Without a sediments supply, marshlands erode and plants die leaving behind open water. Intensive oil and gas industry development in Louisiana has damaged coastal wetlands. Spoil from canals dug to access well sites is piled along canal banks, smothering plants and impeding the flow of water and sediments. Also, the extraction of oil and gas from underground causes the marshes to sink and be replaced by open water. Assessment of the impact of the British Petroleum Deepwater Horizon oil spill is in its early stages. Marsh plants growing 15-30 feet from the shoreline were killed, and as this happened, roots could no longer hold sediments, and erosion from wave action along the marsh edges more than doubled. Moore: How does sea level rise affect coastal wetlands? Sullivan: Sea level rise affects coastal wetlands worldwide. Over time, elevations of marshes rise naturally through sedimentation and vegetation decay. However, if sea levels rise too rapidly, natural sedimentation can be outpaced, and coastal wetlands retreat inland, if possible or disappear. The EPA has predicted that during the next century, sea levels will rise 6 to 13 inches, which would inundate coastal wetlands. Over time sea levels rise during interglacial period, like this one, but the current pace of rise is higher than previous interglacial periods. Sullivan: There are four categories of water plants and each one has a particular set of strategies or adaptations for surviving in water and wetlands. Diver is the playful name I give to plants that grow submerged in water. They float in the water at levels where there is sufficient light for photosynthesis, and are enabled by special air filled tissue to do so. A few are water pollinated, but some like Bladderwort produce lovely yellow or purple flowers above the water. Bladderworts are carnivorous plants that trap small aquatic animals in bladder traps. 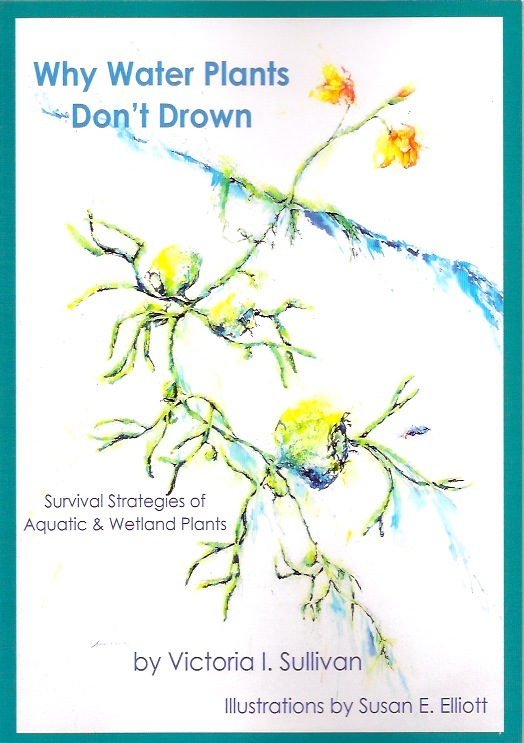 The cover illustration of Why Water Plants Don't Drown is of a bladderwort in flower and shows the underwater traps. Some of the most noxious aquatic plants such as hydrilla and water milfoils are divers. Many species of divers in marine habitats provide important nursery grounds for shrimp and fish. Floaters include a disparate variety of species such as water hyacinths, duckweeds, mosquito fern and others. As the playful designation implies they float on the water surface, un-rooted in the soil. The leaves of water hyacinth act as sails and colonies like great rafts move on lakes and waterways. Water hyacinths invaded from South America and spread throughout the southeastern U.S. from plants given away at the International Cotton Exposition held in New Orleans in 1884. The exotic, purple flowers, with yellow encircled bull's eye nectar guides, attract pollinators. The water lily and lotus are floating-leaf plants familiar to everyone. The circular or heart shaped leaf blades attached to long leaf stalks and float on the water surface. The leaf stalks attach deep underwater to horizontal buried stems. Inside the leaf stalks are hollow passageways for movement of gases from leaf blades downward to roots and back upward to leaf blades. I have dubbed this process snorkeling, which is common among the fourth category of wetland plants. Waders are in the category of plants that grow in wet area with the upper part above water. The depth of water in which they grow varies. Many waders have proven to be snorkelers that are beneficial in oxygenating soils and ridding soils of methane. A few examples include cattails, the several species Spartina, bull tongue, mangroves, bald cypress, and cardinal flower. Leaves receive full sunlight unfiltered by water, have stiff supportive above water plants, and reproduce by seeds. Many in this category are wind pollinated grasses and sedges, which typically have reduced flower parts. Others such as the cardinal flower, with its spectacular red flowers, attract pollinators, in this case insects and hummingbirds. Moore: Artist Susan Elliott is an ecologist as well as an artist, and her illustrations are beautiful. How did you and Susan coordinate the writing and illustrations for the book? Sullivan: I feel very lucky to have found Susan to work with me on this book. Not only is she a wonderful artist, but she has a PhD in botany. We have never met although I feel like I know her. We worked entirely online, and our work began with my preparing a list of what I thought a reader would find helpful to have illustrated. She honed a method by trial and error aided by her knowledge of technique and software. A method evolved in which she emailed a "pencil" sketch attachment of each illustration, on which I commented as necessary, and she would adjust. She then colored using some computerized method, which is still mysterious to me. Moore: Did the two of you have an audience in mind when you began work on the book? Sullivan: I guess you could say we were passionate about making a book that would interest and entertain readers as much as we were interested in the topic. Aquatic and wetland plants are like desert plants in the sense that are found only in certain places. That enhances their specialness for me and digging into the natural history of water plants reveals layers of mystery. Moore: Why is flooding a serious problem for plants if water plants don’t drown? Sullivan: The title is a tongue in cheek because of course, drowning is a phenomenon that happens when lungs fill with water depriving us and any other land animal of oxygen. Plants don't have lungs, but their cells do need oxygen. When soils are flooded, water fills the air pockets between the soil particles and microorganisms use up the rest of the oxygen dissolved in water. Root cells become deprived of oxygen, which they need desperately. Water plants have ways of getting oxygen to the root cells that other plants don't have, and this is why they don't "drown." Moore: Do you and Susan plan to work on another book together? Sullivan: I’m open to the possibility, but we haven’t discussed it.